I love making bread when I have the time. There’s nothing like having an afternoon to set aside to watch dough rise while reading a book or magazine. Normally something goes slightly awry with my bread though. The yeast doesn’t do what it’s supposed to do, the dough doesn’t proof like it should, I over bake the loaf–something. This time, though, it turned out perfect, for perhaps the first and only time (although I’m hoping my bad luck broke and now bread and I will love each other!). When Andrea over at Cooking Books posted a recipe for coconut milk dinner buns, I knew I had to make them. Coincidentally I had leftover coconut milk sitting in my fridge that I didn’t want to spoil, so when the opportunity to make rolls or biscuits for my brother’s birthday dinner (the big 2-7) presented itself, I jumped at the chance to try my hand at yeast again. Perhaps it’s just that my apartment is already unlivably hot and humid (the perfect proofing environment), but the recipe went so swimmingly I can’t believe it. The end result is wonderful! My sister-in-law couldn’t stop eating them they were so good. I used half all-purpose flour and half bread flour and the crumb was perfect. The rolls aren’t sweet at all (any more so than normal) and they were super soft with a satisfying crunch on the bottom. Slathered in Earth Balance, I couldn’t ask for anything more. Dissolve the first teaspoon of sugar in the 1/2 cup warm water, then sprinkle in the yeast. Allow to bloom for 10 minutes before stirring. In the meantime, warm both kinds of milk in a flame-proof bowl or saucepan until lukewarm, stirring all the while. Stir in the Earth Balance, the 3 tablespoons of sugar and the 2 teaspoons of salt, as well as the 1/2 cup warm water. Take off the flame, making sure that the milk isn’t hotter than lukewarm. Then add in the yeast and 2 cups of the flour. A whisk comes in handy hear to beat the dough until starts to become smooth and elastic. At this point, I switched to a wooden spoon and added in about 2 1/2 more cups of flour. Continue to beat until the dough starts to come away from the sides of the bowl. Turn the dough out onto a lightly floured surface and kneed. Add flour as you knead until the dough is smooth, elastic and no longer sticky. Bake for 18-20 minutes, until the buns are a golden brown and sound hollow when tapped on the bottom. Transfer to cooling racks and enjoy! These sound AMAZING! This is definitely my next yeast project. These do sound incredibly delicious. I am discovering that coconut milk serves many uses other than making curries. I just recently noticed on food blogs that coconut milk products are getting some more exposure. I would be all over containers of reduced fat coconut milk if I were in the U.S.
Wow, bread made with coconut milk. That’s a nice idea. Thank you. I love coconut milk – I think I use a can a week in something. These rolls look divine and I would probably eat them all! i could kiss you, Jes – these are ridiculously gloriously awesome! wow! totally going to make them when i have a chance! 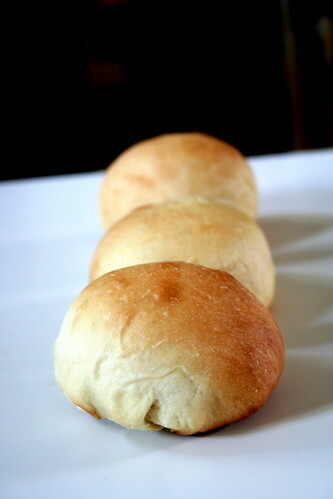 I feel the same way about making bread, it’s an amazing process, and these rolls- even more amazing! awesome! and they really don’t taste of coconut? So pretty! I love a warm roll slathered in EB!!! Wow. I would never have thought to make bread with coconut milk (aka one of my favorite ingredients)…and the photo is awesome! I’ve been a bit coconut-crazed lately, and these sound like the perfect thing to feed my addiction! I bet that coconut milk makes them so nice and soft… Mmm! I love to watch, and wait, for bread to rise, too, Jes. These coconut buns look wonderful. I can almost taste them from here!